In the beginning of December I started a large acrylic in the manner of Flora Bowley. I wanted to step outside of the habit of planning paintings as that method wasn’t working as I found I lost interest in finishing and I am a bit tired of all the unfinished canvas littering the place up. Perhaps if I painted intuitively I wouldn’t lose interest? I really struggled with it at first; I just couldn’t see where it was going there was nada in my head. I left it for a week and then one morning I looked at it and saw these figures and I was off. The above was as far as I got before Christmas. The middle bothered me, but hey I am learning to let it evolve. I kept seeing another figure but something inside of me shouted no. Then yesterday I had some wet paint left over from my small paintings I am doing for the 30 paintings challenge. After an hour’s paint play I had come up with this below. I have actually done more to it today, but the light is bad we are in the middle of a big dark thunderstorm so I will post more about my progress next week. I think it is very derivative of Flora Bowley, but I am not going to worry about that as I discovered that my first journal pages after seeing Teesha Moore’s work were derivative as well, but in a few weeks my own particular style emerged. I am sure my style will emerge with these bigger paintings. One thing is sure I haven t lost interest I can’t wait to get started on it each morning. I just have to remember the “ugly teenager” phase soon passes (thanks Denthe for that!). No 2 - Bad Girl? I had to laugh the other day while I was visiting some friends, they had their granddaughter of 6 years staying, she came into the lounge with such a guilty look and when asked what she had been up to she drew herself up and puffed her chest out and said, “Nothing much Nan”, then added, “the floor in the bathroom is flooded and the shampoo bottle has fallen in it and there are lots of bubbles! I didn’t do it!” It was the defiance on her face that got me. This was today’s painting, I am not happy with it more needs to be done but I have to brood on it for a bit. I decided to post it because if I am to complete 30 paintings I can’t be a perfectionist. I have got to be real and show warts and all. Perhaps it needs a bigger canvas this is only 8 x 10 inches. Have a great day everybody, see you again soon. I like the bright colours in them all! 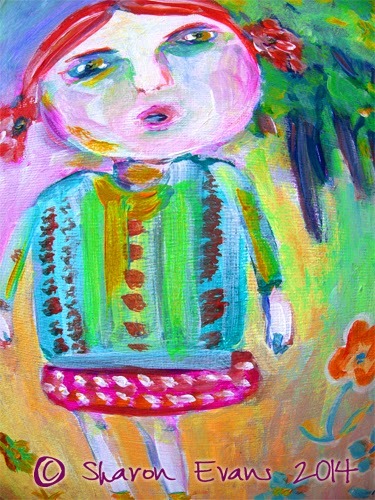 I need to get Floras Book I so want to paint intuitively!! Her classes are quite pricey!! But I love her work and how you find your style through her teachings! Yours is fabulous...and I adore the little girl and that story!! Sounds like a little book to me!! Gather a bunch of grandmas and ask them one funny story about their grandchildren...then illustrate it!! Funny quirky book I'd buy! Sharon, I love the additions to picture 1. It is really coming together. Also, the last two are delightful. I love the expression on the child's face. But even though you aren't happy with #3, I think it is my favorite. 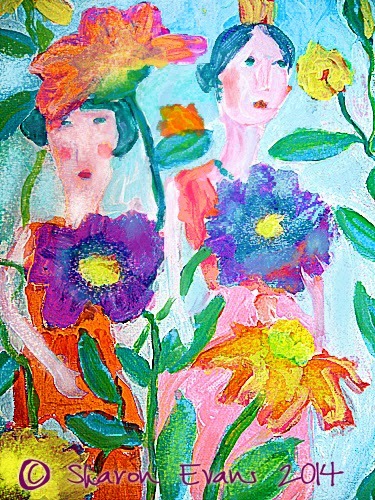 I like the giant flowers and the gorgeous colors. 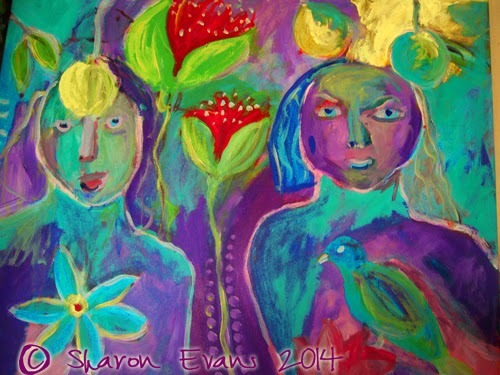 I ove your use of vibrant colors in your paintings Sharon. The progression of your top painting is wonderful-love those red flowers and the added details. Happy PPF and 2014! Sharon these are all lovely pieces of art. I am still cracking up over the friend's granddaughter. I love that you are taking this challenge on. I will be doing a 30 day challenge next month on painting faces. The Flora Bowley method is a fun one to let go and get loose. I like it especially for staring a painting. I look forward to see more colorful art from you in this new year. 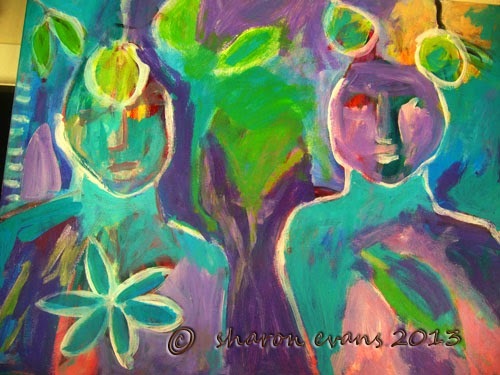 Sharon your colors always dance, wonderful pieces full of life! Best wishes to you dear friend! Lovely works. I absolutely love first. It is amazing. Beautiful composition, outlines and colours. Happy and creative 2014! and thank you for sharing! I love the boldness and free spirit in all these pieces. Happy New Year, my friend! I could have sworn you paint intuitively alllll the time, Sharon. What you've written here surprises me. hm.. I usually have a pencil drawing on the paper or canvas and basic colours worked out then it is intuitive. I have never put paint to canvas without knowing the subject, so I guess I was halfway there! Wonderful, free, and intuitive paintings! The last one is especially nice. Children are funny right? :D So typical, "it wasn't me!" The girl looks funny and sweet. And I especially like the garden lady to the left!